Related Article: Heart Axis Calculation. In adults, the normal QRS axis is considered to be within −30° and 90°, right-axis deviation is considered from 90° to 180º 1. Normal variation (e.g., children, young or slender adults). Left and right arm leads reversal. Acute or chronic lung diseases: Pulmonary embolism, pulmonary hypertension, chronic obstructive pulmonary disease (COPD), cor pulmonale. Congenital heart disease (e.g., dextrocardia, secundum atrial septal defect). Ventricular ectopic rhythms (e.g., ventricular tachycardia). Right axis deviation occurs normally in infants and children 2 (read pediatric EKG). At birth, the mean QRS axis lies between 60° and 160°. By age 1 year, the axis changes gradually to lie between 10° and 100° 3. In the adult population, tall and slender subjects tend to have a rightward QRS axis 2. Reversal of the arm leads is the most common lead placement error. It is the easiest to recognize because of a negative P wave in lead I in patients with sinus rhythm, which is unusual even in the presence of heart disease 2. Negative P wave in lead I. Lead I is upside down because the polarity of the lead is reversed. Lead II is actually lead III and vice versa. Lead aVR is actually lead aVL and vice versa. In patients with atrial fibrillation or unidentifiable P waves, the morphology of the ventricular complexes in leads I, V5, and V6 should be similar. If the polarity of the QRS complex in lead I is opposite that in the left precordial leads, arm lead reversal should be suspected 2. Related Article: Left Fascicular Blocks. In left posterior fascicular block there is a delay in the activation of the posterior region of the left ventricle, which produces a marked right axis deviation (120º or more), without widening of QRS complex. It also causes a rS pattern in leads I and aVL and a qR pattern in leads III and aVF 4. More Information: Left Fascicular Blocks. Related Article: Right Ventricular Hypertrophy. Right ventricular hypertrophy (RVH) causes a displacement of the QRS vector toward the right and anteriorly and often causes a delay in the R wave peak in right precordial leads 5. One pattern consists of predominantly tall R waves (Rs, R, or Qr pattern) in right precordial leads (typical RVH pattern) 2, and second pattern consists of incomplete right bundle branch block, suggesting volume overload 5. More Information: Right Ventricular Hypertrophy. In patients with lateral myocardial infarction, the loss of leftward forces may result in a rightward shift of the QRS vector. In these patients the initial R wave in lead I is usually absent, however, and abnormal Q waves are often observed also in the left precordial leads. Inverted T waves in leads I, aVL, V5, and V6 may also be present in patients with lateral myocardial infarction. The characteristic EKG pattern in patients with chronic obstructive pulmonary disease (COPD) is attributed to changes in the spatial orientation of the heart, the insulating effect of the overaerated lungs, and the low position of the diaphragm. Typical EKG changes of COPD include peaked P waves in inferior leads (II, III, and aVF), persistent S waves in all precordial leads, low R wave amplitude in all leads, and a frontal plane QRS axis that is rightward, superior, or indeterminate. Pulmonary embolism may cause right axis deviation, incomplete or complete right bundle branch block, or EKG signs of right ventricular overload (negative T waves in leads V1-V4, McGinn-White sign or S1Q3T3 pattern). The electrocardiogram is not a sensitive test for the diagnosis of pulmonary embolism. The most frequent ECG finding in pulmonary embolism is sinus tachycardia. Abnormalities of axis are rarely specific in the diagnosis of congenital heart diseases. Tetralogy of Fallot, transposition of the great arteries, total anomalous pulmonary venous return, ventricular and atrial septal defect may causes cause right axis deviation 6. 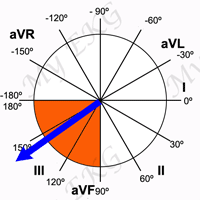 Right axis deviation may also be seen in high degrees of pre-excitation or during a ventricular tachycardia.